The Great Run Company announced its newest event, the Great East Run, in Ipswich on Wednesday (January 25). The half-marathon, which is described as ‘fast and flat’, will be held in the town on Sunday September 24, 2017. Together with their key partners Suffolk County Council, Ipswich Borough Council and Ipswich JAFFA Running Club, The Great Run Company will be bringing the UK’s biggest series of mass-participation running events to East Anglia. The company stages events in over 15 locations including the Great Manchester Run, the Great South Run and their flagship event, the Great North Run in Newcastle – the world’s biggest half-marathon with 57,000 entrants. Following many successful years of the Ipswich Half Marathon, run by Ipswich JAFFA Running Club, organisers plan to take the event to the next level with a closed road course, which will take runners through the town centre as well as taking in some of the area’s most iconic sights. 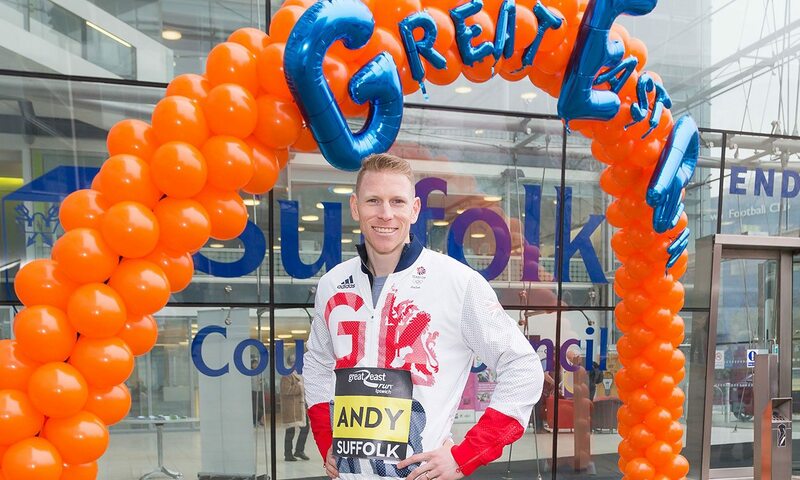 The event launch, which welcomed Rio Olympian and 2016 Great Birmingham Run winner Andy Vernon, was held at Suffolk County Council’s Endeavour House on Russell Road. This location, along with Ipswich Town Football Club’s Portman Road stadium, will provide the backdrop for the event’s start and finish lines. On the new course, runners will pass the prestigious Willis building designed by Lord Foster before heading towards the town’s vibrant waterfront. The route then goes past Felaw Maltings on the way out and back along Wherstead Road, where participants will pass twice under the iconic Orwell Bridge. On returning to Ipswich town centre, runners will pass over the Wet Dock lock gates and continue along the waterfront for a second time, before crossing the finish line on Sir Alf Ramsey Way. Alison Beech, chair of Ipswich JAFFA Running Club, said: “After our hard work establishing this popular event we are absolutely thrilled to be partnering with The Great Run Company. Organisers are also encouraging local companies to get involved in the Business Challenge, which pits local organisations against each other to encourage team building and healthy rivalry. Philippa Morrow, project manager for the Great East Run, said: “We are thrilled to be able to bring the Great Run series to East Anglia. “Ipswich is a vibrant, historic town that will provide a stunning backdrop for this event. “We have developed excellent relationships with our key partners in Suffolk and Ipswich through the success of the Great East Swim and we have over thirty years of experience in organising some of the world’s biggest and most favourite running events. Entries for the Great East Run are now open at Greatrun.org/East.